In the 1980's I bought a 4 year old Welsh pony, Maddomswood Woodsorrel our logo pony (see photo on left) who, due to his severe sweet itch, was probably going to be put down. I had been searching for a suitable pony for my two daughters Camilla and Rosanna (hence Camrosa). I chose Woody, despite his chronic allergy to the culicoides midge bites, as he had beautiful paces and a lovely temperament. The allergy caused sweet itch, which resulted in him rubbing his mane, tail and face until raw with considerable mane and upper tail hair loss. Although we tried a number of alternative products at Ladymeads Farm for Woody, nothing worked to our satisfaction. In the end we formulated our own product Camrosa Ointment, which worked, enabling hair regrowth. 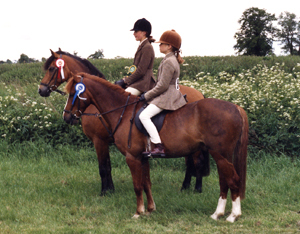 Woody was then ridden and competed on by Camilla and Rosanna for over 8 years winning at national level in working hunter pony classes, mountain and moorland working hunter pony, side saddle, dressage, eventing, show jumping and Pony Club mounted games. Some years later, with veterinary encouragement and with the Veterinary Medicines Directorate's guidance, we decided to go ahead with marketing Camrosa Ointment as a non-medicinal product. The company, Camrosa Equestrian Ltd was formed and started trading in 1997. With Camrosa Ointment Woody led a normal life out at grass, 24 hours a day. He suffered no problems due to midge bites even during the height of the midge season, retaining his full flowing mane and tail, as the logo photo shows him. This is despite the fact that our organic farm attracts large numbers of midges because we are by a reservoir and the area is heavily wooded. Woodsorrel (our logo pony) with Rosanna and Twyford Florin with Camilla in 1987. Woody benefited from Camrosa to relieve the effects of his allergy to midge bites and Florin for sore areas in the ear and scabbing on his legs from mud and wet. Woody continued to give small children tremendous fun and at the age of 26 was still jumping the 4 foot stock fence on the farm with ease, to reach finer pastures! Sadly Woody died in 2005 aged 30 years. Since developing the ointment for Woody we found that it also promoted the natural healing process for a variety of other animals. Camrosa is still run as a family business and our products are supplied worldwide. As you browse through our website, you will see many case studies about our products and the animals that have benefited from our ointment. If you would like any more information please contact us . Edwina Le May, Director, Camrosa Equestrian Ltd.